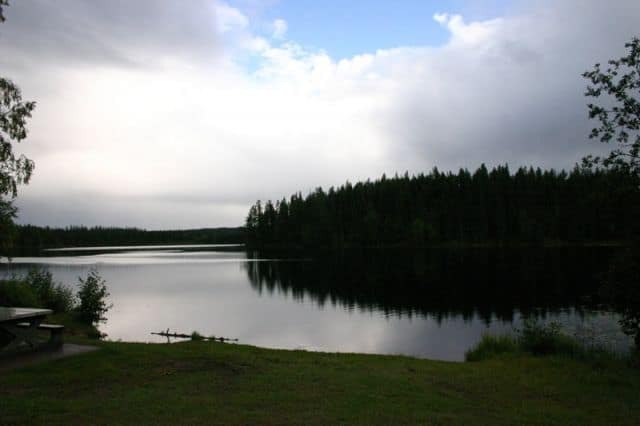 Sai'kuz First Nation Park in Vanderhoof, British Columbia, Canada is a small creekside park in the Stoney Creek First Nation Village located south of Vanderhoof. 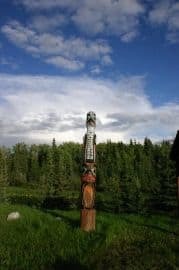 The small park is located on Kenney Dam Road and overlooks the high banks of Stoney Creek protected by two towering Totem Poles. 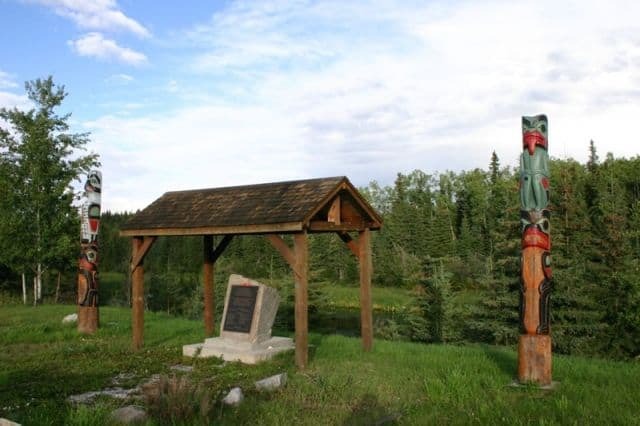 The park is centred around a war rock memorial dedicated to the fallen soldiers from the First Nation Village who died in the world wars. On each side of the rock monument are two beautiful totem poles overlooking the creek. The park borders the high banks of Stoney Creek. When looking down there are little pockets of wetland reeds and water lillys. The reeds provide shelter and protection for the local bird wildlife. Starting at the rock memorial and the totem poles there is a gravel walking path following the river into a stand of trees. Hidden among the trees are various picnic tables and picnic sites to enjoy a shaded lunch and take in some creek views. Not far from the park in the village is a large potlach building used for traditional ceremonies and events held by the local First Nation people. The log constructed building located in the village can hold up to 250 people. The park is located on the same driving route taken to access the Greer Creek Falls Trail and the Home Lake Trail. From Sai'kuz Park on the Kenney Dam Road continue driving to the intersection with Kluskus Road. Turn onto Kluskus and follow the gravel road for 40 kilometres to the first trailhead. How to Get Here: From Hwy 16 in the centre of Vanderhoof, BC, Canada turn onto the Kenney Dam Road and begin traveling west. Travel the short road for a short distance to the Stoney Creek First Nation Village and Sai'kuz Park.